Distinctive features: The first calculator using integrated circuits, 1965. Display is a cathode-ray tube. Electronics uses 29 MOS integrated circuits. There were great production problems with the integrated circuits which delayed the calculator entering the market. Eventually, the model was scrapped with very few having been sold. The photograph above, dated Oct 17 1965, was sent out to newspapers to announce the Victor 3900. The attached caption says "A 4-by-2½-inch illuminated screen in the Victor 3900 records progress toward the solution of a mathematical problem. Work is done in milliseconds by the revolutionary new electronic calculator is seen but not heard". From about 1964 to about 1971 the development of integrated circuits for calculators was at the leading edge of electronics research, and took place largely in the U.S.A.
One of the pioneers was the Victor Comptometer Corporation, which had been very big in the mechanical calculator market. The journal "Electronics" of October 18th 1965 announced "The first commercial equipment to use metal-oxide-semiconductor (MOS) integrated circuits will be introduced at the Business Equipment Exposition in New York City next week when the Victor Comptometer Corp.'s Victor 3900 makes its debut. The desk-top calculator uses MOS ICs that contain 250 transistors each. The integrated circuits are made by General Micro-electronics, Inc."
The development project started in September 1964 with the Victor 3900 appearing in prototype form in October 1965, and the marketing launch scheduled for January 1966. "Metal-oxide-silicon semiconductors, developed for our space program, are now applied by Victor to business calculators! Result: an electronic calculator smaller than a typewriter (only 11" wide, 7½" high, 25 lbs.) that yields intricate calculations at awesome speeds. Silently With a 33% gain in productivity! See all factors on display. Each factor of every problem is displayed on our easy-to-read screen in logical problem-and-solution sequence. And without a maze of unnecessary preceding zeros. 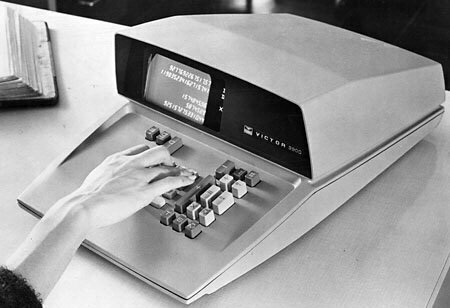 The Victor 3900 provides automatic constants for all arithmetic functions. And the 10-key keyboard is designed with Victor simplicity and logic. Infallible floating decimal. Enter the decimal point just as it appears in the problem. It shows up in the answer where it belongs. Automatically. With no presetting, no possibility of error. 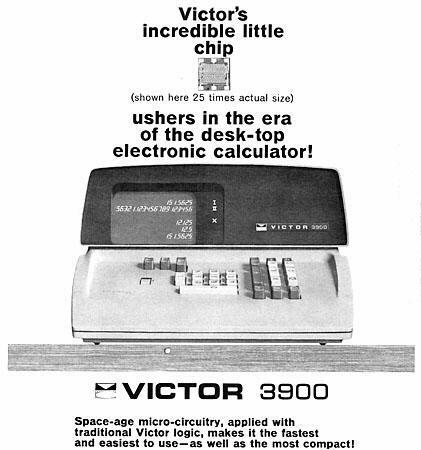 And the Victor 3900 gives you a generous 20-digit capacity! Rounds off numbers automatically. Just tell the Victor 3900 where you want your numbers rounded off. Whole numbers? Two decimal places? Even 15 decimal places? Only the Victor can do it. Three storage registers. The Victor 3900 records and displays the contents of two separate accumulating registers. A third memory register stores factors for instant recall. See it in action before you decide. Call your Victor representative, listed in the Yellow Pages under Adding-Calculating Machines. Or write: Victor Comptometer Corporation, Business Machines Group, Chicago, Ill. 60618. In Canada: Victor Comptometer Ltd., Galt, Ontario." However, General Micro-electronics had great problems making the integrated circuits and this project pushed it into financial difficulties. This resulted in the company being taken over in early 1966 by Philco-Ford Corp., which injected much needed capital. Problems of poor yield of the MOS integrated circuits during manufacture meant that very few calculators were produced. Trying to take too big a step from the lab to production of an IC-equipped calculator, General Micro-electronics stumbled over a number of technical obstacles. Sixteen months ago, at the annual show of the Business Equipment Manufacturers Association, the Victor Comptometer Corp. introduced a radically new electronic calculator that set some startling precedents. For one thing, 29 metal oxide semiconductor chips were to replace nearly 21,000 conventional discrete components. For another, the entire calculator, the Victor 3900, was to be fabricated and assembled by a semiconductor company, General Micro-electronics Inc. of Santa Clara, Calif. After the show, however, the VIctor 3900 disappeared. Last month, executives at Victor and the Philco-Ford Corp., which purchased General Micro-electronics last summer, shamefacedly explained the disappearance. The semiconductor company hasn't been able to manufacture the Victor 3900." Nearly half of the 29 integrated circuits had to be redesigned, including a loosening of the mask geometry from 6 microns to 10 microns. Cost reduction efforts were too stringent and resulted in the use of components that couldn't perform satisfactorily. Engineers who designed the IC's underestimated the difficulty of shifting from hand manufacture in a research laboratory to commercial production. However, redesign of the calculator had been completed and mass production was due to start in the summer of 1967. The project to design the calculator and produce a prototype had begun in September 1964, and a working prototype was demonstrated by October 1965, which made Victor Comptometer over-confident. General Micro-electronics had to move from pilot-line operation to mass production, and this became a nightmare. Production yields on some of the integrated circuits was less than 1%, making them totally uneconomic. By this time the competition was catching up with Hayakawa (Sharp) in Japan marketing a calculator with integrated circuits. Philco-Ford's Microelectronics division seems ready to call it quits on the Victor 3900 calculator, the MOS machine that the company has been building for Victor Comptometer of Chicago. Introduced with great fanfare as the first true desk-top calculator in late 1965, the 3900 has been the hope and despair of the old General Micro-electronics Inc. and the Philco-Ford Corp. that acquired it early in 1966. Engineers at first experienced great difficulty in making extremely complex IC's, and after many false starts, the calculator went into production last fall. But Victor has complained lately that production problems have kept shipments below its requirements. A Victor spokesman said that neither he nor anyone else in the company has been informed of Philco's move. However, it's known that the two companies are negotiating to end the contract, and Philco has already shut down its production line." "Electronic Newsletter", Electronics, October 18, 1965, p26. Young, Lewis H., "Uncalculated risks keep calculator on the shelf", Electronics, March 6, 1967, pp231-234. "Electronic Newsletter: Philco giving up on MOS calculator", Electronics, June 24th, 1968, p25.